We’d love your help. Let us know what’s wrong with this preview of Not Tonight, Mr. Right by Kate Taylor. To ask other readers questions about Not Tonight, Mr. Right, please sign up. I like reading books about problems I don't have, first of all, and I was in the mood to read something easy and non-fiction. This satisfied both. Not only is it right on the money both socially and scientifically, but the writing was breezy and laugh-out-loud funny. I read a lot of it out loud to Jeremy. Gave me good advice to have my character follow. Picked this up because I like the title. Kate Taylor is a hip and informed woman. I read it in one day. Unlike any other book out there. An easy read that makes a lot of sense. Every woman should read this book! 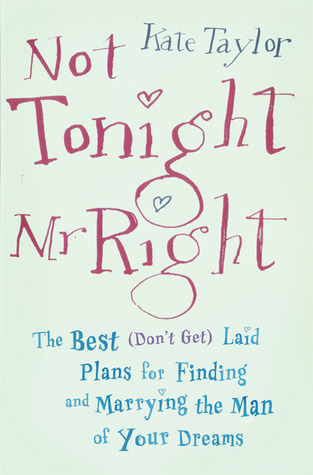 I suppose this book would make more sense when you are starting dating & not already in a relationship. It was pretty humorous to read and it did have little gems of knowledge.